Where it Grows – This wonderful green grows in China, Papua New Guinea, Cambodia, Burma, Philippines, Thailand, Laos, and Vietnam and other tropical areas with lots of water. Also Known As – Water morning glory is also known as “Ipomoea Aquatica” and water spinach, water convolvulus, Chinese spinach, swamp cabbage, river spinach, kangkong, pak bong, ga zun ywet, phak bung, pak bung, rau muong, and a few more names. Growing – Water morning glory grows in rice patties and needs lots of water, or at least very moist soil. It will take over an area so make sure you really want it. Not to Be Confused – Water morning glory is not the same as our morning glory in the states… our flowering morning glory in the states is poisonous. Great Taste – This is my favorite veggie that I order at Asian restaurants, it has rich flavor and a nice crunch that goes well with garlic and lots of other spices and it’s slightly salty and sweet… very nice, I love it! Great for Pregnant Women – Water morning glory contains lots of iron which is important during pregnancy. Anemia – Water morning glory is also wonderful for those who have anemia because it contains lots of iron. Lowers Glucose – Water morning glory also has the ability to lower blood glucose, and it inhibits the absorption of glucose… making it great for diabetics. Easy to Digest – Water morning glory is very easy to digest… making it great for those who are debilitated. And many people feel water morning glory is great for raw food diets. Great Fiber – Water morning glory contains fiber that helps with constipation, creating a wonderful environment for growing probiotic bacteria. Contains – Water morning glory contains lots of protein which is great for building muscle, Vitamins A and C which are powerful antioxidants, B vitamins for energy and good mood, magnesium for enzyme production, and calcium for strong bones. Plus lots of great chlorophyll… one of the best healing agents around. Where to Find – Your best bet to find fresh water morning glory is at Asian markets, and in China Town… plus any markets that specializes in Asian food. I have seen water morning glory in China Town in NY and in SF. How to Prepare – You can steam, stir fry, use in soups and stews, and eat water morning glory raw. 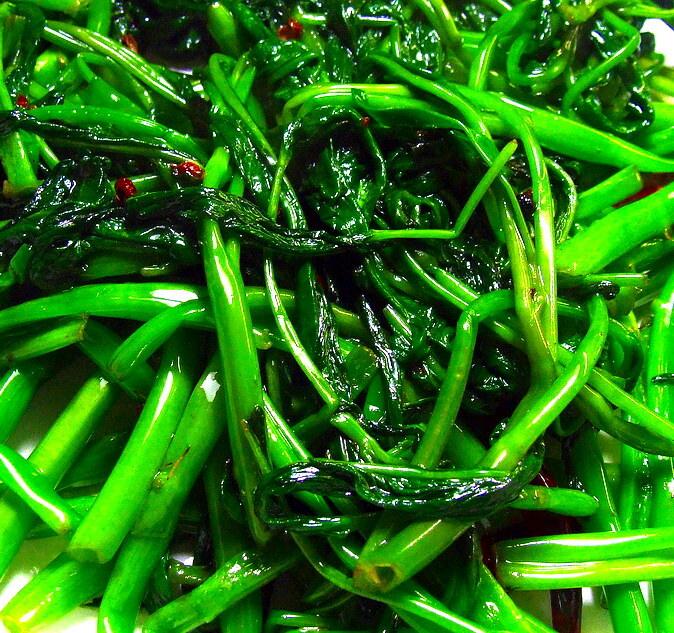 Water morning glory works well in just about any dish that you use regular spinach in… with a much brighter flavor. This entry was posted in Healing Herbs and tagged anemia, Asin, b vitamins, Chlorophyll, Dr. Paul Haider, Easy to Digest, Fiber, Great Green, Great Taste, HH, Iron, kangkong, Lowers Glucose, Master Herbalist, pregnancy, Raw, Soups, Stews, Stir Fries, USA, Vitamin A, Vitamin C, Water Morning Glory Greens. Bookmark the permalink. I am eating this at a restaurant in Hong Kong right now… I must say its my favorite vegetable lately as well. Thanks for posting the health benefits, I’m going to the local street market tomorrow to stock up!